Populations in economically developed countries are ageing fast. This has brought about worries concerning the sustainability of pension schemes and the capacity of maintaining positive economic growth. To counteract the negative effects associated with population ageing, measures are being taken to foster participation at older ages. The measures often rest on the assumption that the older worker from tomorrow will be more able to work than the one from today. However, if this proves not to be the case, participation may end up lower than anticipated. Also, inequalities between population subgroups in front of retirement and welfare may grow bigger. Many aspects are thought to influence participation at older ages. Of these many aspects, we focus on the impact of work ability. Work ability represents the balance between the personal resources that enable to work, on the one hand, and the work characteristics that workers have to cope with, on the other hand. This multidimentional variable includes the many facets of health as well as their interaction with the work environment. We first aim at quantifying the impact of ability to work on total participation. This is being done by using prevalence measures on health state and labour force status. Then, we set out to learn more about changes over time in work ability. We build multi-state models based on transition probabilities into retirement. 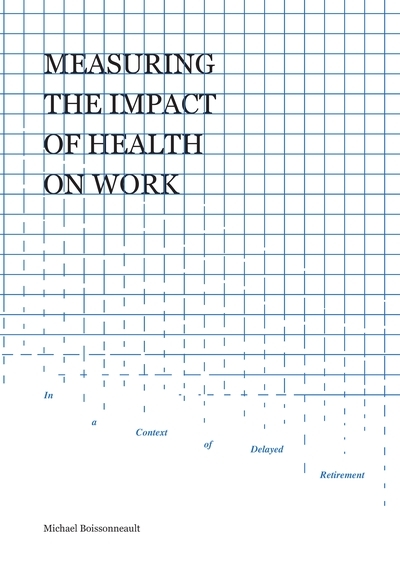 By distinguishing between whether people retire on grounds of poor health or not, we seek to disentangle the effect of work ability on the career length. We will examine whether the occurrence of health-related retirements will increase over time if the number of years people are expected to work will raise.